You are here: Home / health tips / Is There a Difference Between Grilled and Fried? What is so bad about eating fried foods? Well, first, frying a food adds about a third more calories than eating it without frying. 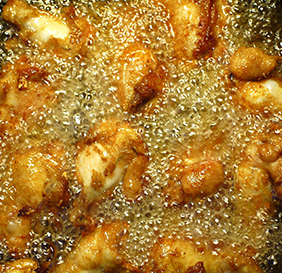 And secondly, the basic oil mostly used today in frying food, is animal based and full of the saturated fats you want to avoid. That is the most common fat that causes your “lethal” LDL cholesterol to increase. The more LDL cholesterol “splinters” you have, the more damage you are doing to your arties. Put the fried foods you eat on a scale and weigh the outcome of what will happen to the arteries in your heart and brain if you continue consuming them as you now do. Just think of all the fried foods you eat — French fries, fried fish, fried chicken, and the list goes on and on. Down south, they even eat fried green tomatoes. Begin thinking grilled rather than fried. But just because you order grilled doesn’t mean you have protected your arteries. You also have to be aware of the type of sauces they are going to place on top of your grilled fish or chicken, or any other entrée. You don’t want cream or cheese based sauces. Whether cooking at home or placing your order at a restaurant, begin developing your lifestyle of eating food grilled rather than fried. Look at a menu and when you see the word “fried”, simply look further. A third less calories and numerous less LDL cholesterol “splinters” — two good reasons not to eat fried foods. Prescription For Life will help you understand why a baked potato is healthier than fries, or grilled chicken is better than fried. Plus, I really do believe raw sliced tomatoes taste better than if they are fried.